This entry was posted in October 1994 and tagged A.R. 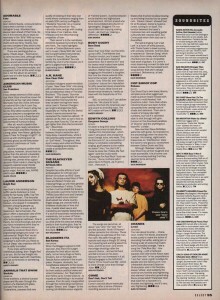 Kane, Adorable, American Music Club, Animals That Swim, Audio Active, Bad Religion, Big Chief, Big Mountain, Blaggers ITA, Body Count, Boyz II Men, Celebrity Squares, Come, Cop Shoot Cop, Cranes, Crazy Gods of Endless Noise, Edwyn Collins, Laurie Anderson, The Blackeyed Susans, The Chesterfields. Bookmark the permalink.